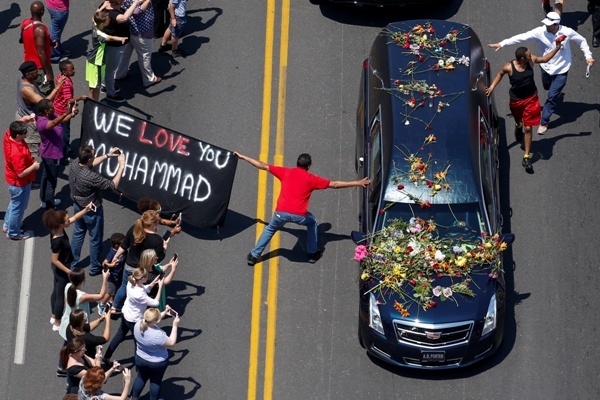 IMAGE: A banner stating "We Love You Mohammad" is displayed as well-wishers touch the hearse carrying the body of the late boxing champion Muhammad Ali. Photograph: Adrees Latif/Reuters. Legendary boxer Muhammad Ali was on Friday buried at Cave Hill Cemetery in his hometown of Louisville, Kentucky. The burial happened after one last drive through his hometown in a motorcade bearing his remains. The processional passed important spots in the legendary boxer, dubbed 'The Greatest', life before heading to the ceremony for the private burial. A public memorial service began thereafter with Quranic recitation, rendered by Hamzah Abdul Malik from the Midtown Mosque (Memphis, Tennessee), as per Ali's wishes. 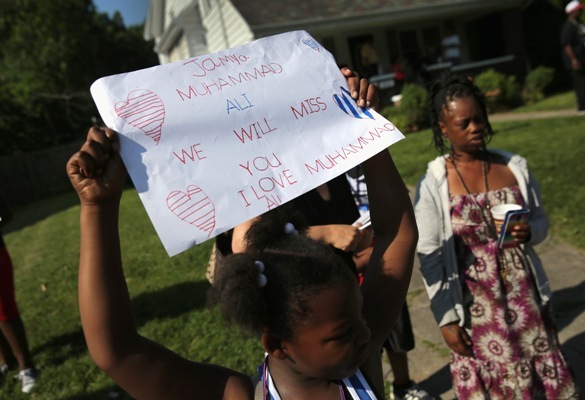 IMAGE: Children wait along the childhood street of Muhammed Ali for his funeral procession to pass by in Louisville. Photograph: John Moore/Getty Images. Fans chanting "Ali!" and throwing flowers lined the streets of Ali's hometown in Kentucky to celebrate the boxing champion who jolted America with his showmanship and won worldwide admiration as a man of principle. Ali, a once-controversial convert to Islam who lost three years of his boxing career for refusing U.S. military service during the Vietnam War, died a week ago at age 74 as one of the most respected men in the United States. Mourners travelled from across the United States and overseas to the city of Louisville to pay tribute to Ali. Many tossed flowers atop the hearse carrying his casket as part of an 18-car procession over 23 miles (37 km) in a farewell unlike any other in recent U.S. history. 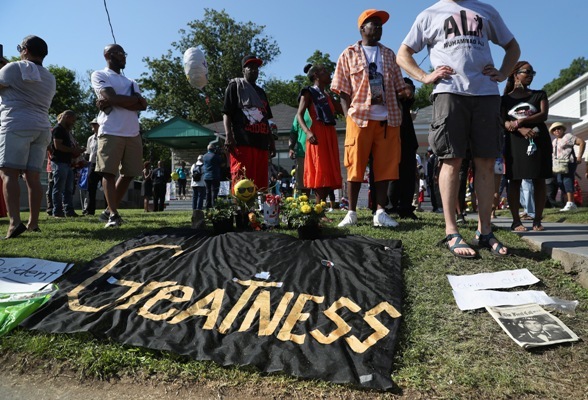 IMAGE: People wait in front of the childhood home of Muhammed Ali in Louisville, Kentucky. Photograph: John Moore/Getty Images. Thousands gathered in the streets and large crowds amassed at landmarks along the route such as his boyhood home in a traditionally African-American section of town and the Muhammad Ali Center, a museum in the city centre. The procession ended at a cemetery for a private burial beneath a headstone reading simply, "Ali." "It was important for me to be here," said Matt Alexander, 63, who travelled from Florida. "I cried like a baby when I heard he'd died. I just didn't want to believe it because I wanted him to live forever." After the procession, thousands of people filled a sports arena for a memorial featuring eulogies by former U.S. President Bill Clinton and comedian Billy Crystal. Jordan's King Abdullah was one of the dignitaries to attend the sports arena for the service. Turkish President Tayyip Erdogan, who attended a Muslim funeral for Ali on Thursday, cut short his visit to Louisville and will not take part in Friday's event as planned.